James Gideon Tanner — better known as Gid — was a farmer in Dacula and played the fiddle on the side. The original group members eventually dispersed while Tanner’s son Gordon took the reins with a new round of performers until he passed away in 1982. Four generations later, thanks to the younger Tanners wanting to take over, The Skillet Lickers are still alive and well and performing on a regular basis. 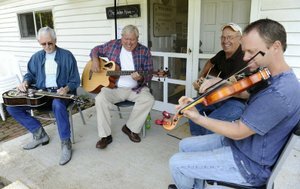 Nowadays, Phil Tanner, his son Russ and friends Fleet Stanley, Larry Holcombe, Joel Aderhold and Brian Morgan still meet in The Chicken House — yes, that was once an actual chicken house — behind the Tanner house off of Auburn Avenue in Dacula to pick, string and sing old-time tunes from Gid Tanner’s time. The men tune their instruments under a tin roofed porch before “jamming.” Before they had this playing space, they practiced in the house. “Ran the chickens out and put a floor in,” Phil Tanner said with a laugh. When the shack was converted in 1955, Phil Tanner and Stanley remember two oil drums that were cut in half with smoke stacks out the roof, which kept them warm during the winter months. Now almost 50 years later, the guys don’t really remember how they got in the group — or when, for that matter, Stanley and Phil Tanner knew each other from high school and had a band together. Holcombe would jam with the guys at The Chicken House for fun and never left. Russ Tanner, well, he’s just part of a family with music in his blood. But a fifth-generation Tanner has begun to take an interest in the music. Phil Tanner’s 13-year-old granddaughter plays the fiddle for different events. “She already knows how to play ‘Down Yonder,'” Stanley said of the young musician. His musical success notwithstanding, Gid Tanner never gave up the homeplace, contenting himself with traveling to fiddle on the streets of Atlanta when it was too wet to plow. Despite his best efforts, Clayton McMichen could never pursue music as is sole profession, even after decades as a major recording artist and radio star. He ended his own days as a welder. If the phonograph record enabled the Skillet Lickers to visit an audience beyond the wildest imaginings of previous generations of southern fiddlers, the hillbilly record radically restricted that listenership. As Mac discovered to his lasting chagrin, New York violinists waxed hot jazz for mass consumption; Georgia fiddlers canned corn for folks downhome. At their best, Skillet Licker records precariously balanced the coarse (epitomized by Tanner) and the fine ( what Mac wanted), crafting timeless art from the common-as-dirt dilemmas of the prewar South. 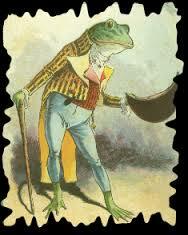 The records are enduring portraits of their makers, especially of Clayton McMichen, who despite his aversion to corny fiddling, despite his affection for symphony orchestras, found himself relegated to the role of a miserable squatter, fiddling endlessly in a dismal swamp where even frogs were out of their element. According to Mac, Wilber C. “Bill” Brown, an A&R man with Columbia Records, took the idea and wrote our scripts for the band members. Another contributor was recording engineer, part-time vocalist Dan Hornsby, who appeared as Tom Sly. Frank Walker, head of the division, also had a hand in the scripts. Corn Licker Still in Georgia became the Skillet Lickers biggest selling series, reportedly selling over a million units. Not only were the skits funny with great music but they were crafted on personal experience. Clayton McMichen and Bert Layne were two of the Skillet Lickers who actually made money from running moonshine. It must have been doubly funny to them. According to Juanita McMichen Lynch (Clayton’s daughter) it was a family operation; her uncles would make it and Clayton would help with the supplies and sell it. Bert Layne told Stephen Davis in an interview, “Me and Mac would go out there (to the still) and buy it, you know. We’d give him $4 for a gallon and we’d take it to Cartersville and sell it for $8.” On one trip Clayton was forced to carry two one-gallon jugs to Cartersville under his sister’s large overcoat. One jug went to a restaurant and another to the 5-and-10 cent store! One hundred songs and fiddle tunes are spread out over 4 CDs in this wonderful bargain set that features the music of probably the most popular old time string band of the “golden age” of country music. Rather than present the recordings in chronological order, the compilers have infused each disc with varying amounts of tracks from different stages of the group’s Columbia and Bluebird work. For example, the first CD starts with 7 of the group’s finest fiddle tunes like ROCKY PALLET, HELL BROKE LOOSE IN GEORGIA and SOLDIER’S JOY, then, after a CORN LICKER STILL In GEORGIA skit there are a handful of their popular and huge selling early pieces like BULLY OF THE TOWN and PASS AROUND THE BOTTLE (with Riley Puckett featured); then there are 6 cuts from their 1934 Bluebird sessions that featured Gid, son Gordon Tanner, Puckett and the fine mandolinist Ted Hawkins, and the disc finishes with 4 more multi-fiddle pieces like NANCY ROLLIN’ and DEVILISH MARY. The same formula is pretty much repeated on the other 3 CDs, and editor Pat Harrison has provided good notes (though hard to read) for each of the discs. 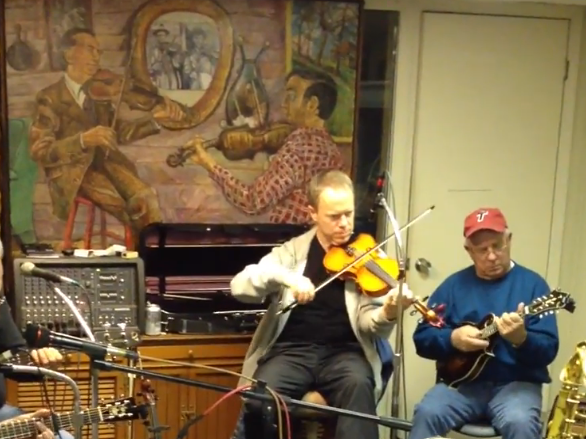 Lots of wonderful fiddle work here, especially by the great Lowe Stokes and Clayton McMichen. Lovers of the Skillet Licker sound will have a field day here.